Belgium were stunned after a quick-fire double from Japan in their World Cup last-16 clash, but they came fighting back in a thrilling encounter. 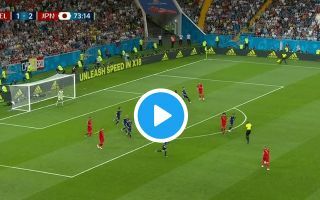 Goals from Genki Haraguchi and Takashi Inui in just four second-half minutes appeared to see Japan all set to cause a huge shock and send Belgium out of the tournament. However, albeit with a stroke of luck, Jan Vertonghen hit back soon after to give Belgium hope again and it wasn’t long before they were level as Marouane Fellaini headed home a great cross as he used his aerial prowess to bag a crucial goal for the Belgians. Both sides deserve plenty of credit as they put on an incredible spectacle with neither looking to defend as they attacked in numbers and in turn produced another thrilling game in what has been a memorable World Cup thus far. Belgium strolled through the group stage with three wins in three, but their credentials of winning the World Cup certainly got a thorough test from Japan who were hugely impressive despite the odds being so heavily stacked against them. Belgium makes it all even in 19 minutes. Fellaini’s header makes it 2-2 against Japan.